Belgrade is a truly impressive city! There are so many exciting places for you to see and interesting things to do that you will hardly have any time to rest when you are there. Situated on the banks of two great rivers, the Sava and the glorious Danube, the city offers its charm to visitors from all over the world, who often wish to come back and enjoy its charisma once again. Once you have arrived in the city center, take a tour round the entire city so you can find your bearings and get a taste of this fantastic city’s atmosphere. 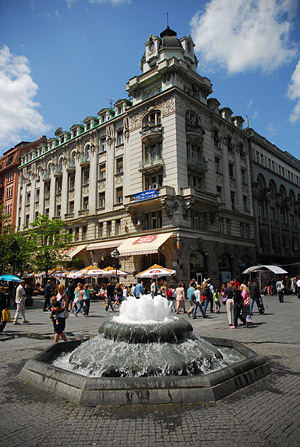 However, one of the places that will definitely catch your attention is the high street called Knez Mihailova. Located in the very city center, between Terazije and Kalemegdan, it looks like a typical high street, crowded with people and decked out with all the usual shops. But only at first glance. The first thing that makes the strongest impression in Knez Mihailova is perhaps its architecture, which is a mixture of classic and modern style. Influential families built their outstanding mansions there in the late 19th century. Also, this busy pedestrian zone in Belgade is home to many cultural sites like the Serbian Academy of Sciencies and Arts, Goethe Institut, Instituto Cervantes, Centre Culturel Français and many others, including book shops and galleries. Besides its architecture, there is something special about this street that cannot be found elsewhere, particularly in summer. Approaching Knez Mihailova, you can hear laughter and voices, along with clinking of glasses from the outdoor cafés and restaurants. There is a friendly, relaxed atmosphere as tourists or Belgraders enjoy their midday meal or just a drink. Busy waiters bustle to and fro carrying mouth-watering plates of food or only refreshments, against a picturesque background of bright sun shining on the exquisite buildings. When you spend several hours in Knez Mihailova, it seems as if no one is at work or that the time has stopped. There is something here for all ages, budgets and tastes. All the way from the Republic Square to Kalemegdan you can find many shops, cafés and street sellers with their small stands, selling souvenirs and snacks. There are many restaurants, local retail shops, souvenir and map kiosks, banks, money exchanges, even business offices. If you are not much of a shopper, you will certainly enjoy just taking a nice walk, watching the people of Belgrade pass you by, especially the gorgeous Belgrade girls and women who are renowned for their beauty all over the world. Moreover, few visitors can fail to be charmed by a local musician playing the guitar, accordion, violin, or just singing a national folk song. If you wish to refresh yourself, besides the numerous cafés, there is a water fountain a halfway walk down the street, where you can wash your face and hands or even drink the water. There is also a pretty fountain across from the Ruski Czar café which is not for drinking but a nice photo opportunity. 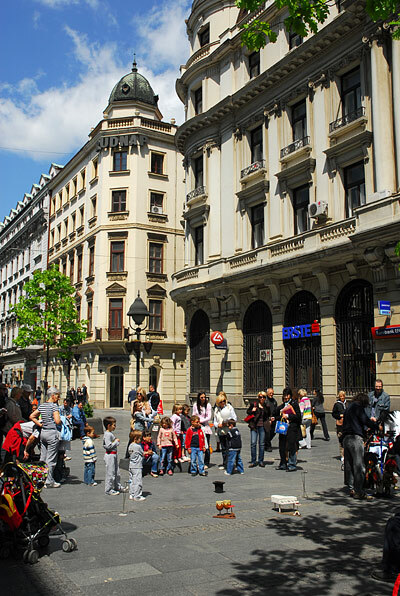 All in all, Belgrade is a delightful city which embodies both the spirit of the modern and the traditional. Unless you witness it for yourself, you will never know what a pleasant atmosphere Belgrade creates, and particularly Knez Mihailova street, which is well worth a visit at any time of the year. 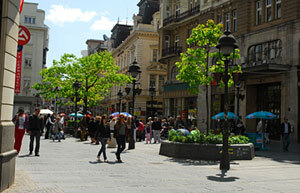 Knez Mihailova offers quality shopping opportunities, similarly to other European capitals’ high streets. If you look for souvenirs, you should go to “Belgrade Window” ( Beograd izlog) located at the corner of Trg Republike and Knez Mihailova. There, you can buy various souvenirs – t-shirts, baseball caps, beer mats, pens, wallets, cups etc., bearing the name ” Beograd “. Also, at the top end of Knez Mihaila Street is a line of eye-catching stalls that sell handmade gifts and souvenirs. But also you can buy either expensive or cheap Serbian or global brands for every taste here. You can find almost anything – from fashion clothes, shoes, sportswear, houseware, books, watches, to toys and clothes for children. Most retailers, restaurants and cafes easily accept credit cards. Several banks and cashpoints are available. Here are some of the shops, brands or boutiques that you can find in Knez Mihailova Street: “Miss Sixty”, “Replay”, “Sergio Tachini”, “Guess”, “Morgan”, “Diesel”, “Levis”, “Zara”, “Mango”, “Happening”, ‘Springfield”, “Time out”, “Nike”, “Addidas”, “Reebok”, “Skechers”, “Office Shoes”, “Legend”, “S&L Watches”, “Swarovski”, “Denny Rose”, “Accessorize”, and many, many more.